Living in a city is great, but sometimes you just need a little peace and quiet. Because of this, Janette and I have started regularly camping at all the different National Parks in the Southwest. While I love sleeping outside, I don’t want to “rough it” when it comes to food. 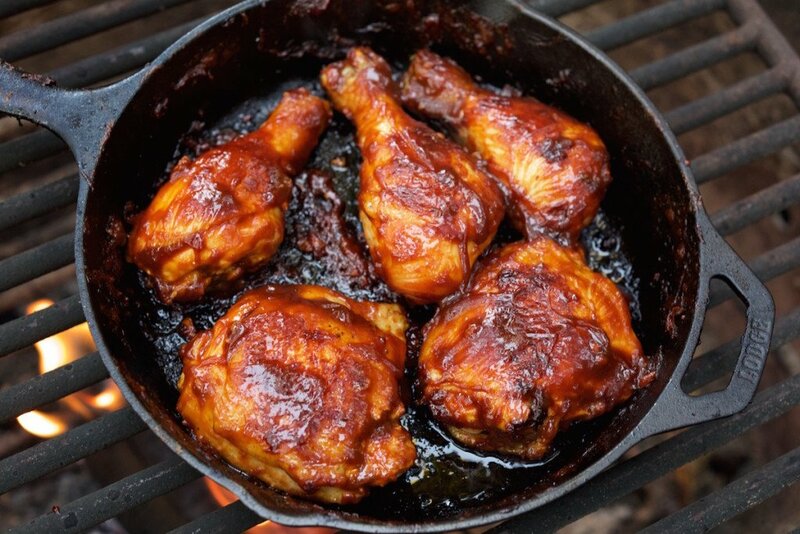 We definitely had everyone in our campsite and all the bears in the Sequoias jealous with the aroma that filled the air while we were cooking this Campfire Whiskey BBQ Chicken. 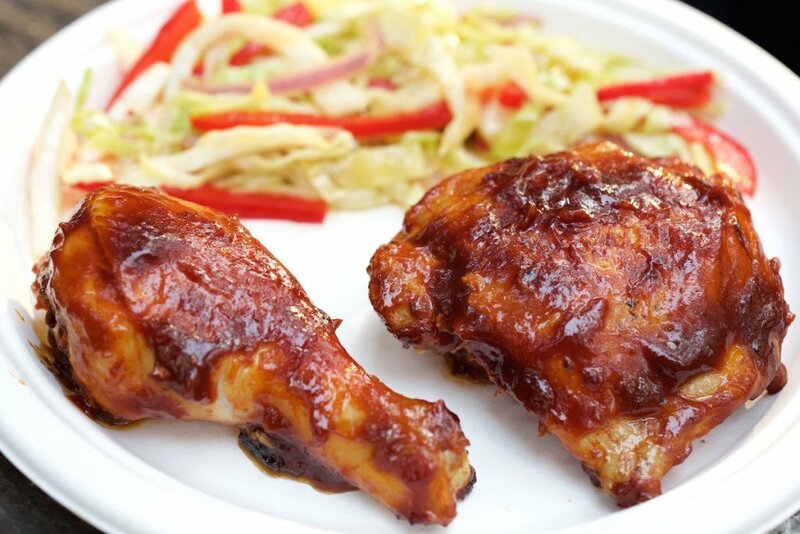 The BBQ sauce can be made at home and stored in the fridge up to a week before your trip. I usually just store it in a large mason jar and throw it in our cooler when we’re headed to camp. 1. Make sauce: Combine ingredients in a medium saucepan. Cover and simmer 45 minutes to blend flavors, stirring occasionally. Add a little water if sauce gets too thick to pour. Let cool, then transfer to a plastic container and chill up to 1 week. 2. Prepare chicken: In a large bowl, coat chicken in oil; pack in a resealable plastic bag and chill up to 2 days, or freeze. 3. Build a charcoal or wood fire in a grill and let burn to medium (350° to 450°; you can hold your hand 5 in. above cooking grate only 5 to 7 seconds). over fire. Grill chicken in skillet until browned all over, about 15 minutes, turning occasionally. Turn again, generously brush tops with some of BBQ sauce, and cook a few minutes; repeat turning and brushing 2 more times, until chicken is well-browned and cooked through, 10 to 15 minutes total. 5. Remove from skillet and top with additional BBQ sauce. Serve immediately. You have style in cooking ..making me go crazy ..i,m a gyspy farrier on the road ..this is hard for me to do .. The weather was so good this weekend that we went camping and tried this recipe. It was by far the best camp food I’ve ever had. The BBQ sauce was to die for! This was the best BBQ sauce I’ve had, thank you for sharing your recipe. Do you recommend skinless or skin on? I like it with the skin on. Stays juicer and you get that little bit of crispiness from the skin. How do you print the recipe? Mccallan 12 is NOT a whiskey!! It’s a scotch, COMPLETELY different flavor profiles. Scotch, bourbon, and rye are types of whiskey. Whiskey is a broad category of liquor and can have lots of differences in color, taste, and smell. We think the smokiness of Macallan pairs exceptionally well with the other ingredients in this recipe. so i can do this anytime – i put chicken in a bowl . poured sauce over it and let it set 24 hours . – let it come to room temp. & cooked it in a hot air fryer @ 340 degrees checking temp of chicken . when cooked through i put another coat of sauce overit and cooked until “ chared “ . this is REALLY GOOD ? Won’t be camping but going to do this tonight in the grill. Sounds delicious! Well I am not a camper (just as my husband)….but I would visit your campfire if you served me this for dinner. This looks and sounds like a great chicken dinner to me. Love the sauce!!! That looks so good. I love barbecue of any kind but homemade is the best! We love camping too, and this is a good idea for camping. I would pre boil the chicken ahead of time and drench the BBQ sauce. This will be good even for dinner. I’m the same way – I don’t mind camping, but I’m not gonna slack on the quality of my meals! I love that this has dijon mustard in it!! I bet this tastes amazing cooked in a cast iron skillet!! Looks delish and and I can see how it would be perfect for a camping trip as well as at home!! Us as well. Camping is fun, but when it comes to food, we want it good like we would make it at home. 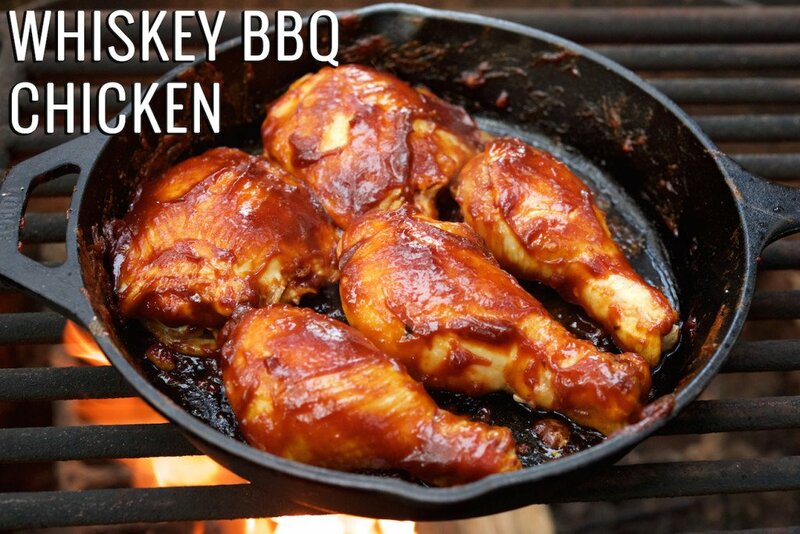 This whiskey bbq chicken recipe is fantastic, both at home and in the outdoors! This looks finger lickin’ good! I love that sauce. It’s always good to find new bbq sauce recipes to keep grilling season is going strong. i like the addition of whiskey in there. You had me at whiskey! 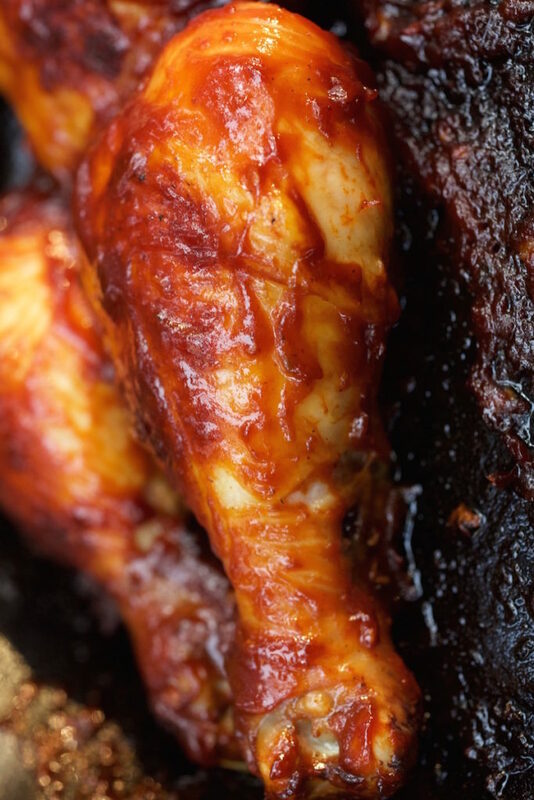 I love a homemade barbecue sauce but I also love making food over an open fire! Looks delicious! How do you clean your cast iron skillet after cooking the chicken at the campground? Just made this for dinner, SO DELICIOUS! Will definitely make it again!